Solzhenitsyn wrote the above in his monumental The Gulag Archipelago, which details the history and horrors of the Soviet labor camps, published 45 years ago. The book was met with instant international acclaim; one review in the New York Times called its subject “the other great holocaust of our century.” In the wake of its publication, Solzhenitsyn became something of a pop-culture cold war hero in the U.S., where interest in militarism and interventionist policies had been fading in the aftermath of Vietnam. 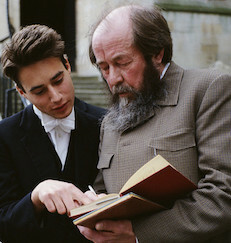 Solzhenitsyn’s belief that Russia should turn away from international military involvement and embrace the Church and its own rich cultural history was favorably received by conservatives, as was his view that the U.S. had capitulated too quickly in Vietnam. Liberals embraced him as a dissident and rebel, though he was criticized for his insistence that Lenin was as culpable as Stalin for the monstrous atrocities of Soviet totalitarianism, and that the political state is often its own end regardless of its founding ideology. President Carter, a famously moral person who spoke openly against violence and advocated daily prayer, was unable to effectively sell his vision that U.S. voters should cultivate temperate, self-transcendent characters. Solzhenitsyn’s warning in this era that human life must consist of more than “the search for the best ways to obtain material goods” vanished in a country weary of recession and fearful of international terrorism, and is similarly lost today in a nation where people fear slipping into poverty at home as a result of stagnant wages and vanishing jobs, and see only an unstable and violent world abroad. Yet Solzhenitsyn’s warning that Americans—humans—are prone to self-interest and self-indulgence is one we should still heed. His insistence that the human tendency to keep one’s head down in the presence of injustice proliferates injustice is especially urgent in our moment, when the temptation to retreat into private life can seem so seductive. In this dangerous world, getting involved is a necessary self-transcendence; “the fulfillment of a permanent, earnest duty” as Solzhenitsyn put it; a call to witness; a call to action. Guest blogger Jaime Hovey is Associate Program Director for Virtue, Happiness, & the Meaning of Life at the University of Chicago. She has taught literature, writing, and gender studies in Chicago since 1998, has a Ph. D. in literature from Rutgers and a J.D. from the University of Illinois, and is the author of A Thousand Words: Portraiture, Style, and Queer Modernism (Ohio State University Press, 2006) and other articles on queerness and literature. This article reprinted with permission.